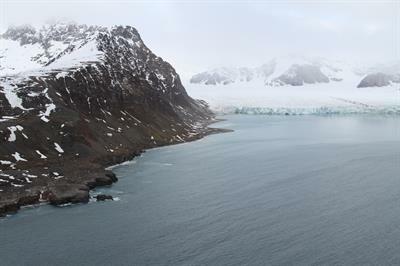 An American cruiseship passenger in her 60s was killed and three others injured when a rubber inflatable boat that was carrying them closer to shore in the Arctic archipelago of Svalbard was hit by a wave. All 13 persons on board the boat landed in the icy Arctic water. Local authorities reported that the accident occurred as the passengers on board the cruiseship Sea Spirit were being taken on a sightseeing excursion along the northern portion of the Fjortende Julibukta (the 14th of July Bay) in the Krossfjord. The area is located near the Northwest Spitsbergen National Park, north of both Svalbard’s administrative center of Longyearbyen and the settlement at Ny-Ålesund. Details remained sketchy as local officials tried to determine how events unfolded before they got their first call for assistance at around noon on Monday. Emergency crews were told a woman had been injured in a boat accident in the Krossfjord and was being examined by the cruiseship’s doctor. When the helicopter reached the cruiseship, the woman was dead, Alfheim said. Three others in the boat that’s also used for ship-to-shore shuttles and excursions suffered what officials later called “minor” injuries. Two of them were flown in the rescue helicopter to the hospital at Longyearbyen for treatment. He said the authorities hadn’t yet established the circumstances around the accident and the woman’s cause of death was unclear. She lost consciousness during the accident and her body was being sent for autopsy, according to a press release from the local governor’s office on Svalbard (Sysselmannen på Svalbard). The accident is under investigation. The governor’s office reported Tuesday that the witnesses told them the boat was hit by a large wave and “tossed around.” All its passengers were hurled into the water and later swept ashore. The Sea Spirit cruiseship is operated by Quark Expeditions of the US and billed as an “all-suite ship” in the luxury segment of the cruise industry. It carries a maximum of 114 passengers, compared to the thousands on board large cruiseships, with 15 of its large suites offering private balconies. The vessel is approved for polar waters and offers cruises in both the Arctic and Antarctic, South Georgia and the Falklands (Malvinas). Quark Expeditions’ website reported that the vessel was equipped with rubber inflatable boats, called Zodiacs, for shore transfers and excursions.